William Clark was an American explorer, soldier, and public administrator. He is best known for the Lewis and Clark Expedition which he co-led with his friend Meriwether Lewis. 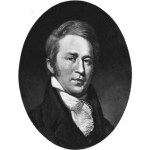 William Clark was born in 1770 in Virginia, but was raised in Kentucky. Although the knowledge regarding his ancestry is very limited, his parents are believed to be of English and possibly Scottish heritage. In 1803 President Thomas Jefferson acquired from France's Napoleon Bonaparte territory that became known as the Louisiana Purchase. Jefferson commissioned a two year expedition to explore these lands and chose Meriwether Lewis as the leader. Lewis then chose his friend William Clark as his second in command. Lewis and Clark were accompanied on most of the trip by a young Shoshone woman named Sacagawea. She was instrumental to the success of their mission as her presence let the Native American tribes they met along the way know that their intentions were peaceful. The mission lasted two years, starting in 1804 and ending in 1806. There are a few known famous kin for William Clark, the most prominent being his brother General George Rogers Clark. His brother George was the highest ranking American military officer on the northwestern frontier during the American Revolution. William Clark is also connected to Maj. Gen. Robert Anderson who was the commanding officer at Fort Sumter when it was surrendered at the start of the U.S. Civil War. The movie actor Montgomery Clift is also a cousin. Hopefully future research will reveal more of William Clark's ancestry and possibly lead to additional famous kin.